“Hotel California” is the title track from the Eagles’ album of the same name. The song was released as a single in February 1977 and writing credits for the song are shared by Don Felder (music), Don Henley, and Glenn Frey (lyrics). 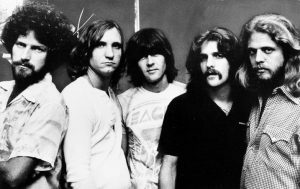 The Eagles’ original recording of the song features Henley singing the lead vocals and concludes with an extended section of electric guitar interplay between Felder and Joe Walsh. The song is considered the most famous recording by the band, and its long guitar coda has been voted the best guitar solo of all time by readers of Guitarist in 1998. The song was awarded the Grammy Award for Record of the Year in 1978. Now, you will have the chance to hear the amazing Don Felder and Joe Walsh isolated guitar tracks. The melody of the song was composed by Don Felder in a rented house on Malibu Beach. He recorded the basic tracks with a Rhythm Ace drum machine and added a 12 string guitar on a four-track recording deck in his spare bedroom, then mixed in a bassline, and gave Don Henley and Glenn Frey each the resulting demo cassette. Felder, who met the Eagles through his high school bandmate Bernie Leadon, said that Leadon advised him to make tapes of songs he wrote for the band so that other band members like Henley, whose forte is in writing lyrics, might work with him on finishing the songs they like. The demos he made were always instrumental, and on every album project he would submit 15 or 16 ideas. The demo he made for Hotel California showed influences from Latin and reggae music, and it grabbed the attention of Henley who said he liked the song that “sounds like a Mexican reggae or Bolero”, which gave the song its first working title, “Mexican Reggae”. I was more than happy to uncover this page. I wanted to thank you for your time due to this wonderful read!! I definitely savored every bit of it and i also have you saved to fav to look at new stuff on your website.